This listing includes events hosted by Mennonite Church Canada and its regional churches, special celebrations of MC Canada congregations, events at Mennonite-related organizations, and community events of interest to Mennonite readers. Some of these also appear in the print issue of the magazine. You can submit an item here or send an email to calendar@canadianmennonite.org. If an event is to appear in print, please send the information at least eight weeks in advance. Theatre of the Beat presents Yellow Bellies, an historical drama that highlights the experiences and public response to Mennonite conscientious objectors during WWII, on Friday, April 26 at Floradale Mennonite Church in Floradale, Ont. 7:30 p.m. Tickets are $20. Spring concert, at CMU, Winnipeg, at 7 p.m.
Mennonite Heritage Village Auxiliary fashion show, including dessert and door prizes, at the MHV Auditorium, at 7 p.m.
MC Eastern Canada annual church gathering, "Deepening our relationship with God," at Steinmann Mennonite, Baden. Keynote speaker: April Yamasaki. Theatre of the Beat presents Yellow Bellies, an historical drama that highlights the experiences and public response to Mennonite conscientious objectors during WWII, on Saturday, April 27 at Valleyview Mennonite Church in London, Ont. 7:30 p.m. Tickets are pay what you choose starting at a suggested price of $15-$20. The Mennonite Historical Society of Alberta invites you to its 2019 AGM and Spring conference at Highland MB Church (4018 Centre B St. NW) in Calgary. The theme is "Mennonites, Nazis and the Holocaust," and the featured speakers will be Dr. Colin Neufeldt and Dr. Hans Werner. The AGM starts at 10:00 a.m. with a light lunch available, and the conference starts at 1:00 p.m. with Faspa and visiting to follow. Theatre of the Beat presents Yellow Bellies, an historical drama that highlights the experiences and public response to Mennonite conscientious objectors during WWII, on Sunday, April 28 at Waterloo North Mennonite Church in Waterloo, Ont. 7:00 p.m. Tickets are pay what you choose with a starting range of $10-$20. MCC Ontario meat canning, in Leamington. Mennonite Mass Choir and the Waterloo Chamber Players present Felix Mendelssohn’s symphonic cantata, Hymn of Praise, at St. Peter’s Lutheran Church, Kitchener, at 7:30 p.m.
Camp Valaqua spring work day. Call 403-637-2510 for details. Exhibitions by Yisa Akinbolaji and Gabriela Aguero open at the Mennonite Heritage Centre Gallery, Winnipeg. Runs until June 22. May 4, 2019 | Location: B.C. Women’s Inspirational Day, at Emmanuel Mennonite, Church, Abbotsford, from 9 a.m. to 3 p.m. Speaker: Sarah Bessey. Soli Deo Gloria Singers present “A time for everything under heaven”; (4) at UMEI Christian High School, Leamington, at 7:30 p.m., (5) at Leamington United Mennonite Church, at 3 p.m. For tickets, call UMEI at 519-326-7448. Detweiler Meetinghouse, Roseville, hosts “Sounds of spring,” featuring Bluebird, a Guelph-based women’s a cappella barbershop quartet, and the Fiddlestix String Quartet from Rockway Mennonite Collegiate, at 2:30 p.m.
“Understanding conflict: Foundations,” presented by Credence & Co., at Conrad Grebel University College, Waterloo. “Understanding conflict: Advanced,” presented by Credence & Co., at Conrad Grebel University College, Waterloo. “Healthy boundaries in the context of ministry,” at Faith Mennonite Church, Leamington. For more information, visit mcec.ca. Junior youth (grades 6 to 8) retreat, at Silver Lake Mennonite Camp, Sauble Beach. Activities include learning new songs from the new “Voices Together” hymnal, creating a music video and worshipping in a Taizé style. Westgate Mennonite Collegiate bursary banquet, at the Canad Inns Polo Park, Winnipeg. For more information, or to purchase tickets, visit westgatemennonite.ca. Westgate Mennonite Collegiate work day. SMYO youth retreat, at Elim. For youth in grades 6 to 12. RJC golf tournament fundraiser, at Valley Regional Park, Rosthern. Detweiler Meetinghouse community memorial service, at 3 p.m. For more information, call 519-504-4591. Westgate Mennonite Collegiate junior-high spring concert, at Bethel Mennonite Church, Winnipeg, at 7 p.m.
Westgate Mennonite Collegiate senior-high spring concert, at Bethel Mennonite Church, Winnipeg, at 7 p.m.
MCC Relief Sale, in Coaldale. Common Ground Treaty Walk, from Edmonton (Treaty 6) to Calgary (Treaty 7). For more information, email Steve Heinrichs, director of MC Canada’s Indigenous-Settler Relations, at sheinrichs@mennonitechurch.ca. “#ChurchToo conference, responding to professional sexual misconduct in the church, at CMU. Planned jointly by CMU, MC Manitoba, MB Manitoba and MCC. June 2, 2019 | Location: B.C. Mennonite Historical Society of B.C. presents “Immigrant trauma and finding belonging in community: The story of post-Second World War Mennonite refugees,” with speakers Marlene Epp and Paul Born, at King Road MB Church, Abbotsford, at 2:30 p.m. Faspa and special music. “Land and place,” a North American Institute for Indigenous Theological Studies symposium on Indigenous theology, at Tyndale Seminary, Toronto. MC Canada will help sponsor six participants from the nationwide church who want to attend. 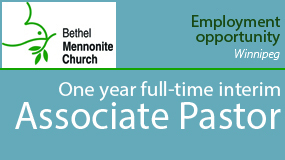 For more information, email Steve Heinrichs at sheinrichs@mennonitechurch.ca. MC Alberta women’s retreat, at the Sunnyside Retreat Centre, Sylvan Lake. Speaker: Irma Fast-Dueck. Theme: “The many faces of Mary: A companion for the journey.” For more information, visit mcawomen.com. Chicken barbecue fundraiser, at Hidden Acres Mennonite Camp, New Hamburg. For more information, visit hiddenacres.ca. Annual heritage retreat, at Camp Valaqua. For more information, email ruthannagetsmail@gmail.com. “Healthy boundaries in the context of ministry,” at First Mennonite Church, Kitchener. For more information, visit mcec.ca. “Spirituality and aging” retreat, at Conrad Grebel University College, Waterloo. Camp Valaqua hike-a-thon fundraiser. For more information or to sponsor a hiker, call 403-637-2510. Voices Together worship workshop, at Mount Royal Mennonite Church, Saskatoon, from 1:30 to 4:30 p.m. For more information, visit mcsask.ca/mc-sask-events. Camp Valaqua garden party. For more information, call 403-637-2510. RJC musical, alumni reunions and graduation weekend, Rosthern. MennoHomes Out-Spok’n for Affordable Housing Bike-a-thon, at Elmira Mennonite Church. Options for hikers, recreational bikers and avid cyclists. For more information, visit mennohomes.com. MC Canada wants to sponsor four people to travel to Colombia with Christian Peacemaker Teams. Meet human rights defenders who are working for a just peace in Magdalena Medio, and explore questions of faith and discipleship. To learn more, email Steve Heinrichs at sheinrichs@mennonitechurch.ca. June 28, 2019 to July 1, 2019 | Location: B.C. “Igniting the imagination of the church” MC Canada delegate assembly, at the Quality Hotel and Conference Centre, Abbotsford: (28) leaders assembly; (29) business/delegate meeting; (29-1) inspirational conference. Special events for youth and children. “Discovery: A Comic Lament,” a play about Indigenous/settler issues and moving forward together,” at the CMU chapel, Winnipeg, at 7:30 p.m. Tickets available at Eventbright.com. "Towards a just peace," the annual Bridgefolk conference for Mennonites and Roman Catholics, at Canadian Mennonite University, Winnipeg. The focus will be on church and social relationships with First Nations peoples. Keynote speakers: Steve Heinrichs of MC Canada, and Sister Eva Solomon, and Ojibwe elder. For more information, visit bridgefolk.net. “Shake: Rattled by the Radical,” a gathering for Mennonite youth in grades 6 to 12, at Shekinah Retreat Centre. For more information, visit prairieyouth.ca. Early deadline for travel subsidies and sponsor discounts is April 26. Shekinah music camp, for campers aged 12 to 17. 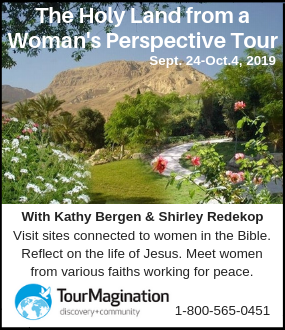 For more information or to register, visit shekinahretreatcentre.org. October 5, 2019 | Location: B.C. 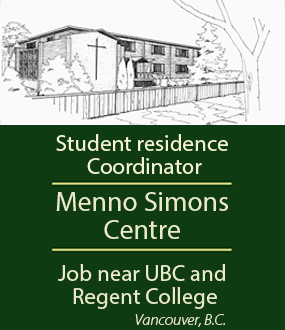 Mennonite Historical Society of B.C. fundraiser, with comedian Matt Falk, at the Mennonite Heritage Museum, Abbotsford, at 7 p.m.
November 8, 2019 to November 9, 2019 | Location: B.C. Mennonite Historical Society of B.C. genealogy workshops, at the Mennonite Heritage Museum, Abbotsford. "Following Jesus together as Anglicans and Mennonites, Pt. 2," at Renison Institute of Ministry, Waterloo, from 9 a.m. to 4 p.m. Instructor: Pablo Hyung Jin Kim Sun. November 18, 2019 to November 22, 2019 | Location: B.C. Annual Christmas market, at the Mennonite Heritage Museum, Abbotsford. “Choose your own adventure trip” raffle, in support of Mennonite Heritage Village. Five trip options to choose from. To purchase tickets online until Dec. 6, visit bit.ly/mhv-raffle.